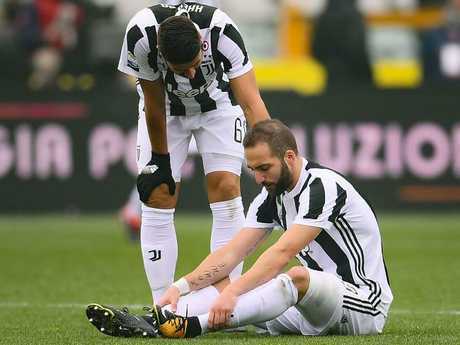 JUVENTUS top scorer Gonzalo Higuain suffered a sprained ankle while winger Federico Bernardeschi took a knock to his left knee in their bruising 1-0 derby win over Torino. 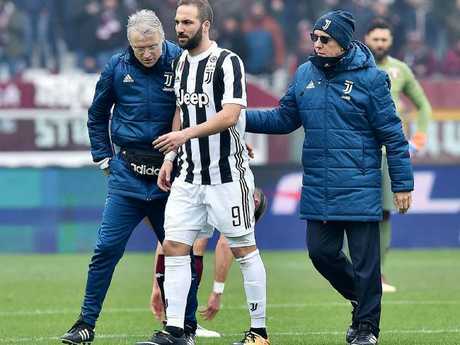 Argentinian striker Higuain suffered "a sprain and bruising of his left ankle," the team said, with Bernardeschi having ligament damage which could rule him out for up to five weeks. "For both players, further tests are planned in the coming days," Juventus said in a statement. Higuain has scored 24 times this season for the champions including a double in the first nine minutes of last Tuesday's Champions League last 16 first leg tie against Tottenham in Turin before the English club forced a 2-2 draw. The 30-year-old pulled up three minutes into the game at Torino following a clash with rival goalkeeper Salvatore Sirigu. He continued on for another 12 minutes before being replaced by Bernardeschi, who set up Brazilian Alex Sandro to score the only goal on 33 minutes. Bernardeschi, 24, then went off injured late in the second half. 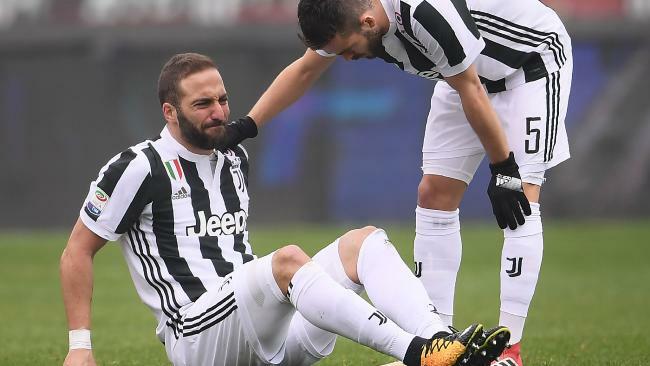 Higuain will likely miss next weekend's Serie A tie against Atalanta, while Bernardeschi could face a longer time sidelined, ruling him out of the Champions League return leg at Wembley on March 7. Juventus -- second in the league table one point behind Napoli -- already have a long injury list with Mario Mandzukic, Blaise Matuidi and Juan Cuadrado recovering but there was good news with Argentine Paulo Dybala making his comeback from a hamstring injury in the second half and playing half an hour. Juventus' Argentinian forward Gonzalo Higuain. Meanwhile, Serie A leaders Napoli have edged out struggling SPAL 1-0 to stay one point clear of Serie A champions Juventus. In Naples, home winger Lorenzo Insigne sent an early drive against the post before his Brazil team-mate Allan raced in the box to slot past Alex Meret on six minutes. 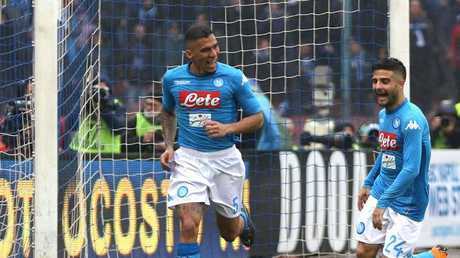 Jose Callejon's volley was saved in the first half as captain Marek Hamsik and Dries Mertens were also out of luck for the Neapolitans. Third-placed Roma lag 15 points from the top after Saturday's 2-0 win at Udinese. Roma moved past Inter Milan, who lost 2-0 at Genoa, in the race for Champions League places. Lazio can move past Inter to clinch the final place for the elite tournament if they beat second-bottom Verona on Monday. Bologna won 2-1 against Sassuolo, who had Edoardo Goldaniga dismissed with four minutes to go. Erick Pulgar curled home the winner from a free-kick in the regional derby. Bottom side Benevento also found a late winner from substitute Cheick Diabate to win 3-2 against Crotone, who themselves sit fourth-bottom, four points above the three-team drop zone. Juventus's Gonzalo Higuain, centre, leaves the pitch.